Florida State has been one of the most successful football programs seen in recent years. It's no wonder that tickets for Florida State football are so popular! 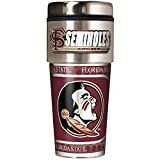 Florida State is coming off a powerful era in it's history with the retirement of Bobby Bowden as head coach and the promotion of Jimbo Fisher. The Seminoles compete in the Atlantic Coast Conference against the Boston College Eagles, the Clemson Tigers, the Maryland Terrapins, the North Carolina State Wolfpack, the Wake Forest Demon Deacons, the Duke Blue Devils, the Georgia Tech Yellow Jackets, the Miami Hurricanes, the North Carolina Tar Heels, the Virginia Cavaliers, and the Virginia Tech Hokies. Under the leadership of Bobby Bowden, Florida State football rose to national prominence with several bowl victories, state and division championships, division titles and national championships. The Bowden era was bound to come to an end, however. When Bowden retired, the Seminoles promoted Jimbo Fisher to be the ninth head coach in Florida State Football history. The Fisher era has been successful so far. Florida State has had one of the top recruiting classes for 2010. In his first season, FSU was 10-4 with a 6-2 ACC record. They went to their first ACC championship game since 2005, but lost to Virginia Tech 44-33. They did notably beat the Miami Hurricanes 45-17 and the Florida Gators 31-7, to win the first "state championship" since 1999. Florida State would then go to the Chick-Fil-A Bowl, beating Steve Spurrier's South Carolina Gamecocks, 26-17. In his second season, Fisher took the Seminoles to a 9-4 overall record with a 5-3 record in ACC conference play. 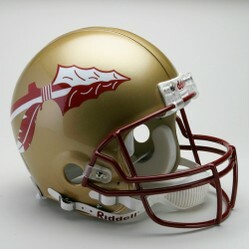 The Seminoles did, however, win the state championship for the second year in a row, defeating both Miami and Florida. Florida State also beat Notre Dame in the Champs Sports Bowl. Fisher brought in another top-ranked recruiting class in 2012. Despite what some pundits say, it looks like Jimbo Fisher’s future with the Florida State football program is secure for the time being. Judging from the lessons he has learned from the Bobby Bowden over the years, tickets for Florida State Football may become hot items again as the Seminoles take off in the new era. As with any college football program, there are traditions associated with the Seminole team. The team mascot, Chief Osceola and Renegade are major traditions, as are the lighting of the spear the night before game, the Fight Song, The War Chant, and the Tomahawk Chop, among others. The Seminole tribe has given their blessing to FSU to use the figure of the historic Chief Osceola as a mascot. The tradition of Osceola riding into the stadium on his trusted pony Renegade to plant a spear in the opposing team’s end zone is a long standing one. The War Chant and Tomahawk Chop are fan favorites during a game. They are intended as psychological tricks to be played against the opposing team. The Sod Cemetery is another favorite tradition. It is a burial ground for snipped pieces of grass from other fields a “sod game”, or significant victory away, is played. Where Will The 'Noles finish in the polls? Sportula 3-Piece Sets include The Sportula, Tongs and Fork and all are made of heavy duty stainless steel and hard maple handles. The University of Kentucky Wildcats also have a very strong football team. Check them out. The Clemson Tigers are an ACC football powerhouse. Don't miss them! A doorbell is a humorous way to enlighten the unbelievers to one of the most popular denominations in America: College Football. This article is about the Virginia Tech Hokies. It includes school and team info and stats.